PHUKET: An operations center set up at Phuket Provincial Hall is accepting donations to help the more than 100,000 people affected by devastating floods in Thailand’s central and northeastern regions. Seven people have died so far from the floods, with tens of thousands more displaced. 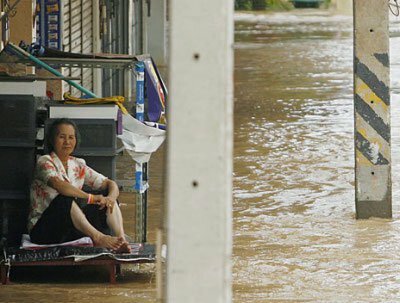 Nakhon Ratchasima, the worst hit province, had to evacuate one of its main hospitals. The center, organized jointly by Phuket Provincial Office and Phuket chapter of the Red Cross, will accept donations of items such as dried or sealed food, drinks, clothing and medicine. The center, located in the new building at the Provincial Hall complex, is open from 8:30am to 4:30pm daily. For more information about the Provincial Hall collection center call 076-216118. Meanwhile, Kusoldharm Rescue Foundation President Benjawan Tamphanuwat today announced that 2,000 packs of dry food provided by the foundation will be delivered to people in need in Nakhon Ratchasima. Two trucks will leave Phuket on Wednesday evening, bound for the flood-stricken province. The Kusoldharm Foundation is accepting donations at its headquarters on Takuapa Road in Phuket Town. For more information call 076-246301 or 076-246599.